As a little experiment, I made a short first time video on the Pineapple Candleheath (Richea dracophylla) last month. Note that I got the specific epithet wrong (I said Richea ‘dracophyllum‘) in the video. It’s endemic, it’s delicious. What more can I say. 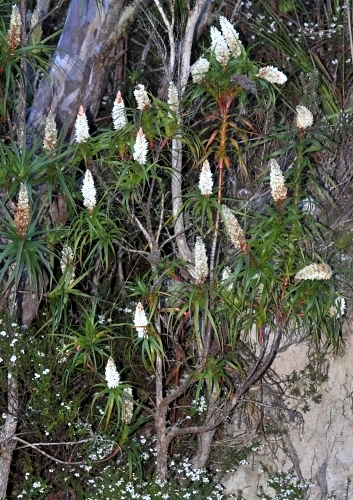 This entry was posted in Bush Tucker, Tasmanian Endemics, Videos and tagged epacrids, Ericaceae, Pineapple Candleheath, Richea dracophylla, Videos. Bookmark the permalink. 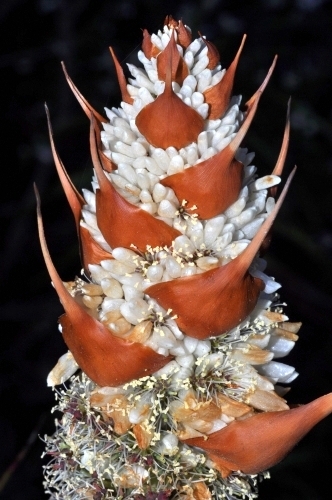 Do you know if other Richea spp have edible nectar? I tried out the nectar of Scoparia (Richea scoparia) just the other day but there was only a very mild sweet taste at the base of the detached petal caps. It could be that R. scoparia doesn’t produce as much or that I just didn’t get at it at the right time. It is worth noting that skinks go for the nectar, to the extent of pulling of the ‘caps’ to get to the nectar. The Bog Candleheath (Richea gunnii) has almost similar sized flowers and may be worth a try but I haven’t done so yet. The Pandani (R. pandanifolia) doesn’t look worthy of trying. The flowers are much smaller than the Pineapple Candleheath. The same applies to the remaining Richeas.